Highest quality handwired guitar amps with amazing tone! Very high quality Vibratone footswitch controller & crossover replaces the cheapo setup that came with the Fender Vibratone and Leslie Model 16 and 18. It also simplifies the connections since the crossover components are contained within the footswitch housing. In the original setup, there was an extra unit with additional connectors for the crossover. These are hand built in our shop in Atlanta and feature Carling switches, Switchcraft jacks, rugged cast metal enclosures, heavy gauge 15′ rubber-jacketed control cable (prevents signal loss), correct value crossover components to match the original Fender specs. The 5 pin connector is made of heavy-duty Bakelite and features a durable metal housing. 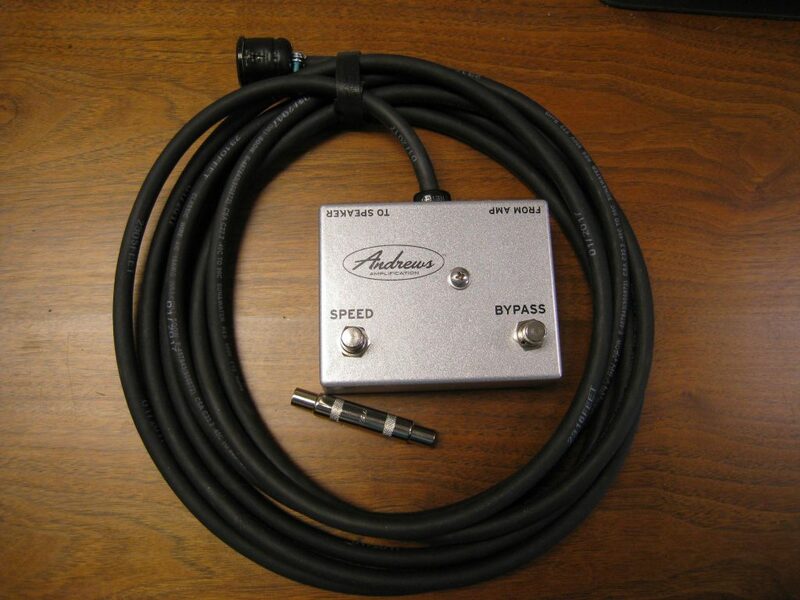 We include a double-female 1/4″ adapter so it can be used with amp heads and combo rigs. Requires 2 good quality speaker cables to connect to your amp and speaker (not included). This product is covered by our 1 year limited warranty. There are 2 buttons on the unit. One switches from high to low speed for the rotating effect. The other switches the sound from “amp only” to “amp and Leslie”. When in “amp only” mode, the amp functions normally with all frequencies going to the amp speaker. When in “amp and Leslie” mode, the midrange is routed to the Leslie and the bass and treble remain in the amp speaker. This insures best Leslie effect while maintaining the full spectrum to your tone. If you prefer to run your Leslie full-range with no crossover, we can custom build this unit without the crossover circuitry for $30 less. Just let me know via message or call. If you intend not to use the crossover, keep the following in mind. The crossover capacitor in the Leslie cabinet limits deep bass tones in the Leslie speaker which is a good thing. Those frequencies many diminish the swirling speaker effect and can also damage the speaker if the amp is too powerful. The crossover components in our unit reduce midrange frequencies on the amp’s built-in speaker (or extension cabinet) whenever the Leslie speaker is turned on via the footswitch and it sends them to the Leslie speaker where they should be. The highs and lows are routed back to the amp speakers and the mids go to the Leslie. This enhances the Leslie effect because those frequencies are most present in the rotating effect. We recommend using the crossover for best effect and to help protect your speaker from burnout and to retain the highs that would be lost in the Leslie cabinet. There is a crossover capacitor (mentioned above) in the metal box in the back of the Leslie cabinet that would need to be jumpered to get the complete full range signal to your Leslie speaker if you are using a setup without a crossover.. Contact us for international shipping charges. We also offer a modification to make this device remote switchable. The modification adds a power supply, and AC cord, switching relays and a stereo footswitch jack. All this allows the unit to stay in the backline so there are fewer cables running to your pedal board. 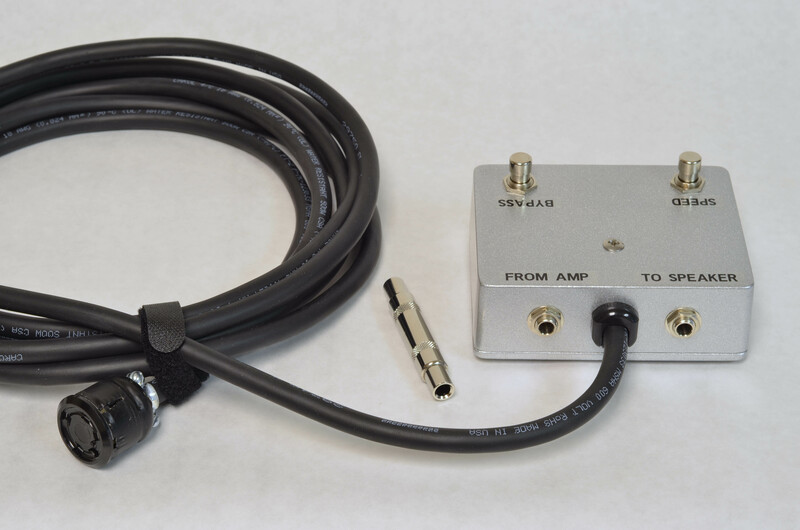 You can connect a standard non-LED 2 button footswitch with stereo 1/4″ plug to the jack and control speed and speaker switching from your pedal board. This mod is built to order so please allow 5 to 7 business days for shipping. 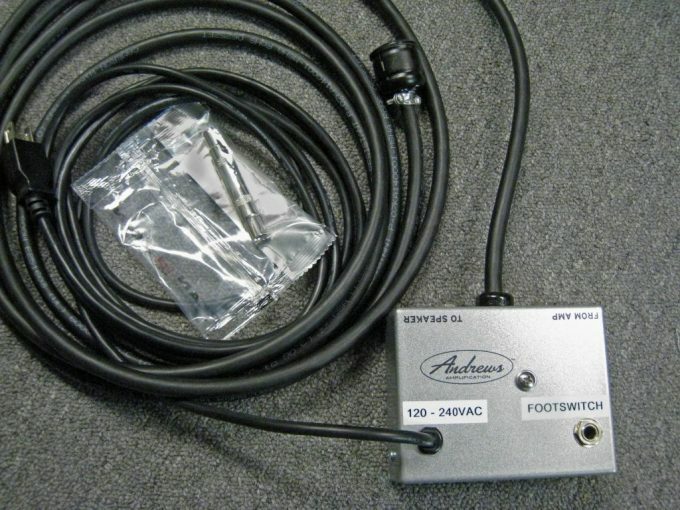 We can also supply a generic Marshall-style footswitch of you don’t already have one.